Small - $74.99 Only 2 left! Large - $74.99 Only 4 left! We were swimming off the coast of New Zealand when we noticed something splashing in the water. At first, we thought it might be a whale, dolphin, or some other type of underwater beast, but when we got closer we noticed that we were wrong. Very wrong! On a raised rock, basking in the saltwater waves, we found a mermaid. She was singing beautifully and opening up clams to look for pearls. Startled by our sudden arrival to the ocean's surface, she gasped and tried to dive back under the water but our friendly disposition made her halt and she stuck around. We struck up a friendly conversation with the mermaid and we found out that we have a lot in common. Swimming, singing, and fishing are some of our most favorite activities! As the sun was starting to go down, we waved goodbye to our new fishy friend and we swam back to shore. We didn't think that anyone would believe that we actually came face to face with a real-life mermaid and...we were right! We even gave plenty of detailed accounts of our confrontation with the legendary finned creature but we were met with plenty of skepticism. 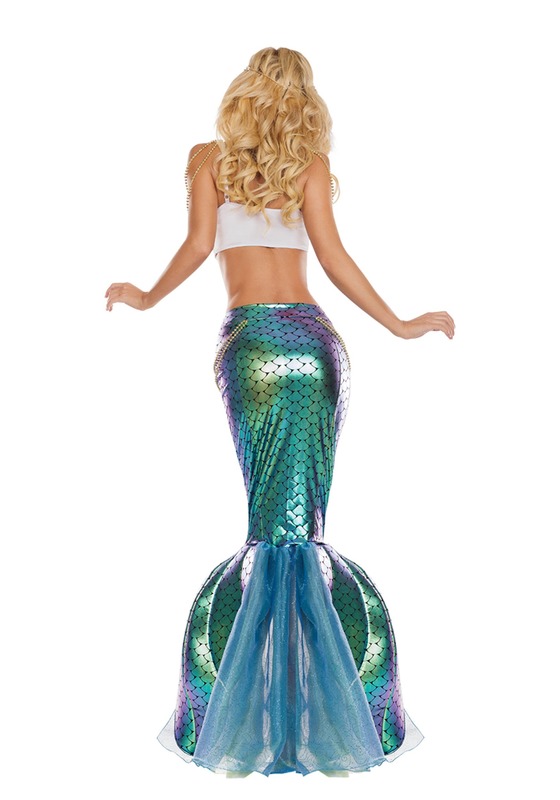 In an attempt to satisfy the doubters, this costume was created based on what the mermaid was wearing that day. The white and gold bralette features sparkles and sequins and gold chains that dangle down around the shoulders. The iridescent skirt features a scaly pattern and a skirt that fans out in true fishtail fashion. 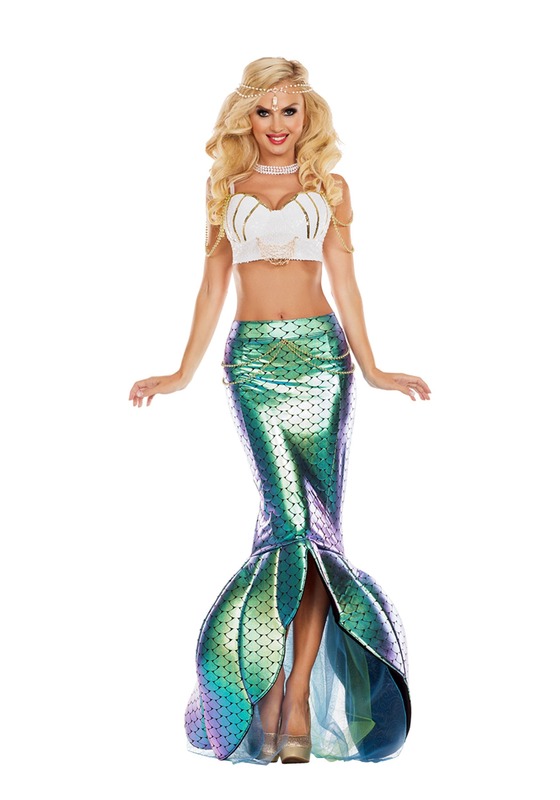 Gold chains droop down around the waist.Wear this costume to look like a true mermaid!